Last month (October 2017), I was traveling with members of the Pink Boots Society on a ten day trip through Southern Germany to soak up some of the richest beer culture in the world. One of the most memorable stops along the beer road was at a quiet cluster of towns in the Oberpfalz (Upper Palatinate) in Eastern Bavaria. There stands a communal brewing tradition over five hundred years old called Zoigl (pronounced tsoy-gul). The word defines the way of life that revolves around brewing and enjoying beer made by and for a tightly knit community, and makes for a prime example of what the beer drinking environment should be. Night was closing in on the sleepy town of Mitterteich as our small coach rolled up to the Kommunbrauhaus (communal brewery). Two kind gentleman met us outside, and led us into the dimly lit building. A brew kettle of copper and brick was stacked up on the right, while portable vessels and pallets of coal sat patiently on the left. This place was unlike the other breweries we had been visiting for the past week. This one was raw, and seemingly prehistoric. After viewing multiple stainless steel and computerized brew systems at other breweries, a coal-fired kettle seemed unrefined but intriguingly rustic. Zoigl was something entirely different from my past experiences, and I was ready to drink it in. The place we were standing in did not belong to any one person or company – it was a communal brewery belonging to the citizens of the town in which it sat. 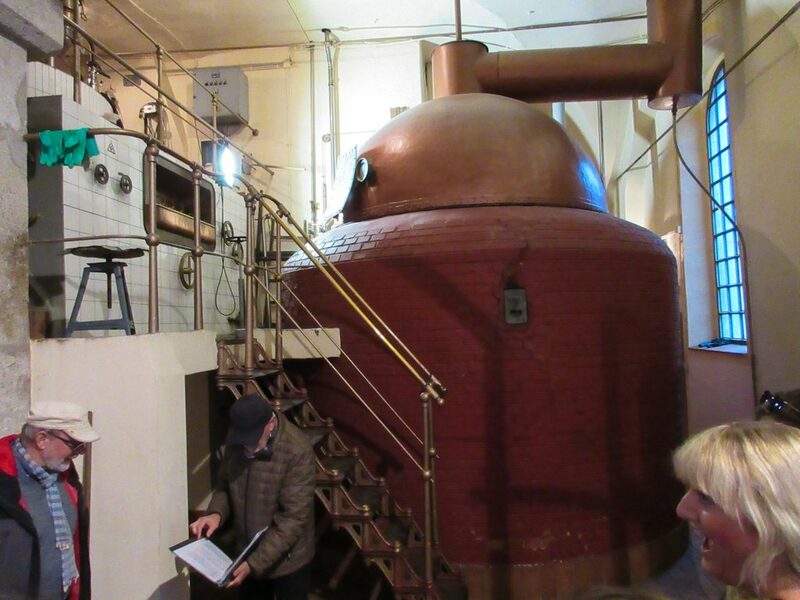 If you are a citizen of Mitterteich, you have the right to brew beer at the Kommunbrauhaus. The same goes for citizens of the other four towns and their respective Kommunbrauhaus’ in which Zoigl is still practiced. Those that own specific properties in the town also have the right to sell the beer they make. These locations are called Zoiglstuben, or temporary pubs, and are part of the family’s home who owns the property. Often times, the Zoiglstuben is in the first floor of the house, offering the beer created at the Kommunbrauhaus along with a small selection of local meat, cheese, and bread. 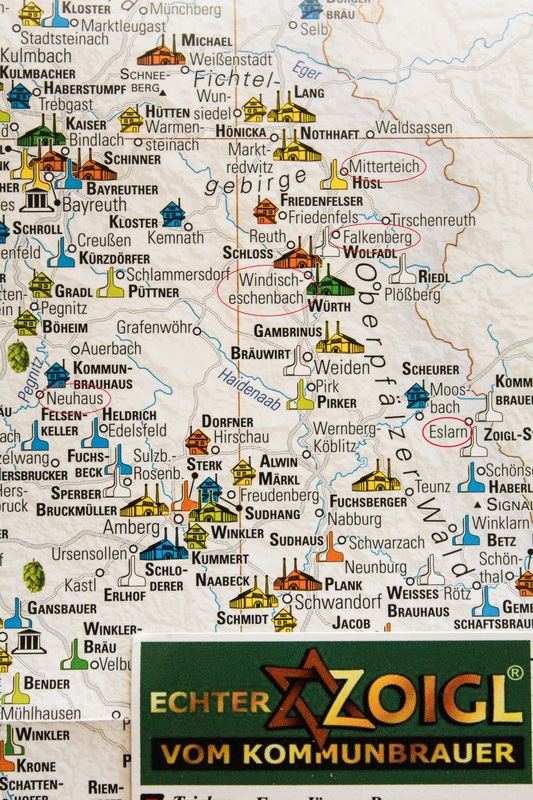 The five remaining towns that practice Zoigl are circled in red: Mitterteich, Falkenberg, Windischeschenbach, Neuhaus, and Eslarn. 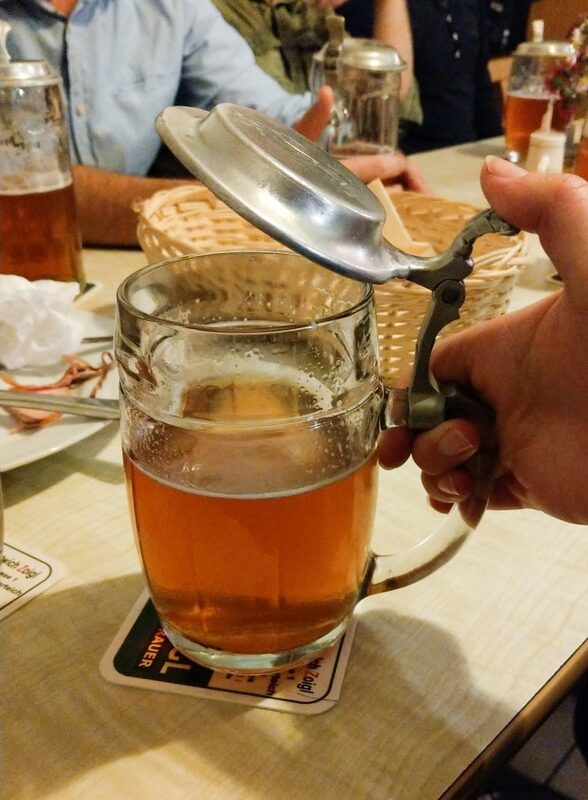 Here’s the interesting part – once town brewers have made wort (sweet, unfermented beer) at the Kommunbrauhaus, they load it up into a portable vessel and take it home. You won’t see any shiny stainless steel fermentors or bright tanks at the Kommunbrauhaus, only tanks on wheels waiting to be filled and hauled off via tractor. 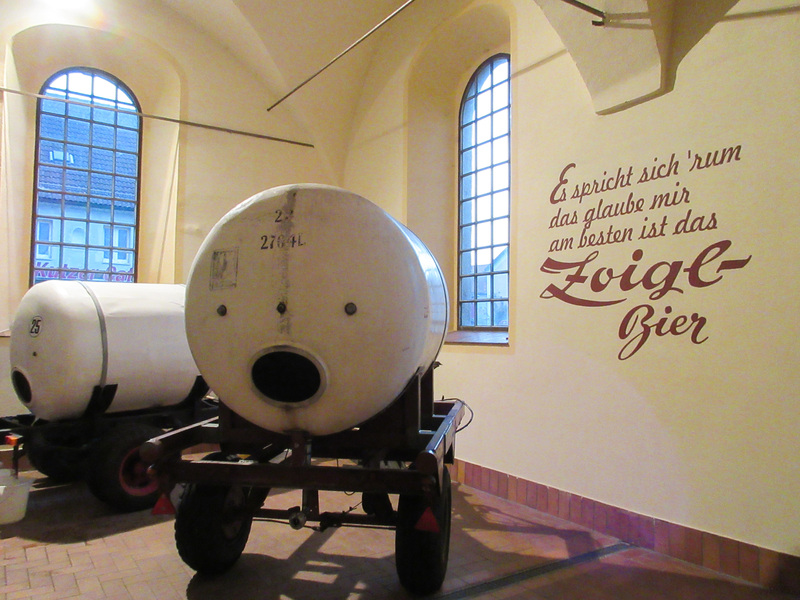 The brewers with the right to sell their Zoigl-bier then care for it at home in cellars that are sometimes two levels below street level. After fermentation is complete, the beer is left to lager (cold condition) for 4-6 weeks before serving in the Zoiglstube. As mentioned previously, these Zoiglstuben are temporary pubs, and only open when beer is available. These pubs look like typical houses, so how can you know which is a Zoiglstube, and more importantly, if they have beer available? Enter the Zoigl Star. Composed of two triangles, the hexagram is a sign (which is where Zoigl gets its name from) placed above the Zoiglstube to tell us where we can get our next half liter of super local brew. The Zoigl Star is often confused with the Star of David. However, the Zoigl Star, aka the brewer’s star, has been used as a guild sign for brewers and maltsters since the 15th century, two centuries before it was officially adopted as a Jewish symbol. The six points created by the two triangles are symbols of alchemy, and signify the three elements and three ingredients used for making beer. The top triangle stands for fire, water, and air (elements), and the bottom inverted triangle stands for water, malt, and hops (ingredients). Knowledge of yeast was not yet discovered when the symbol was created. If a Zoigl Star is stolen from atop the building, which I suppose happens relatively often, a small bush is hung in its place. It’s a funny sight, but it does the job! Darkness and a brisk chill had taken over by the time we poured out of the Kommunbrauhaus and back into the coach. 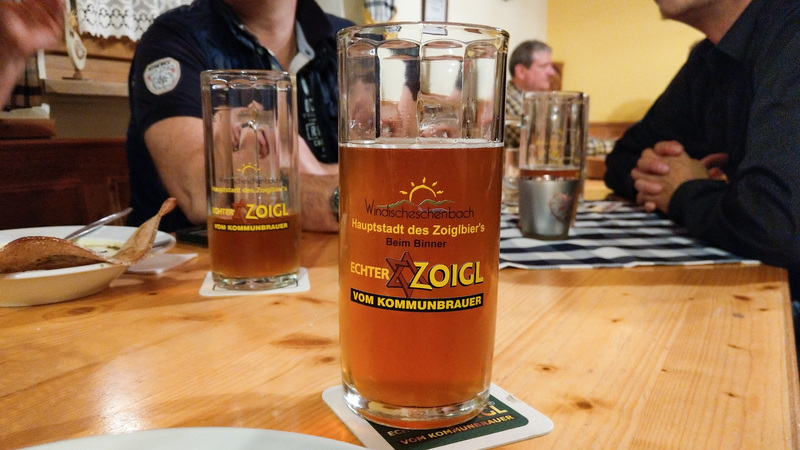 Our next destination was a Zoiglstube called Hartwich Zoigl where we would finally taste this mystical Zoigl-bier for the first time. The house was packed, and our group of 15 had no chance of sitting together at a table. But this is the spirit of the Zoiglstube. 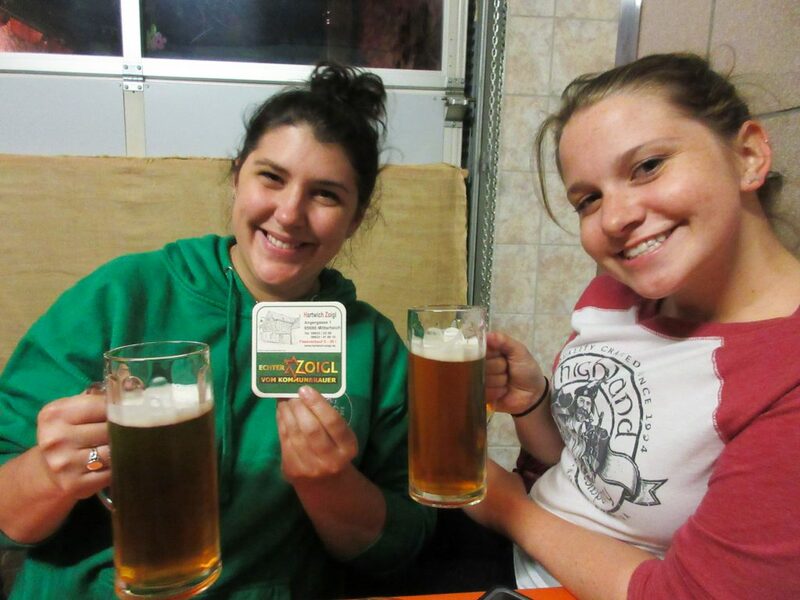 When Zoigl-bier is in hand, everyone is your neighbor, even if you’re from the USA, Australia, Canada, or Peru, as some of us were. You sit where there’s a place to sit, and you converse (sometimes in broken German) with your neighbors at the table. While it may be frightening for some, it was actually delightful! We all split up into smaller groups. Myself, Bridgette, and Katie found a small nook in what appeared to be a garage-turned-pub. We each ordered a half liter of the only beer available (Zoigl-bier) and made small talk with the people next to us. They assured us this was the best Zoigl in town, and explained they came here because the atmosphere was right, and the cost was dirt cheap. They also noted bars in town have trouble competing with the Zoiglstuben because it’s hard to beat a half liter for €1.90 ($2.22 USD) and the cozy charm of your neighbor’s house. America, take note. I admittedly wasn’t expecting much from the beer itself. Seeing the equipment it was brewed on and knowing the brewers were basically large scale homebrewers, I would be happy if the beer was at least drinkable. And drinkable it was! I can’t say it’s the most amazing thing I ever put in my mouth, but it was full of character and not overwhelming in any one flavor or aroma. 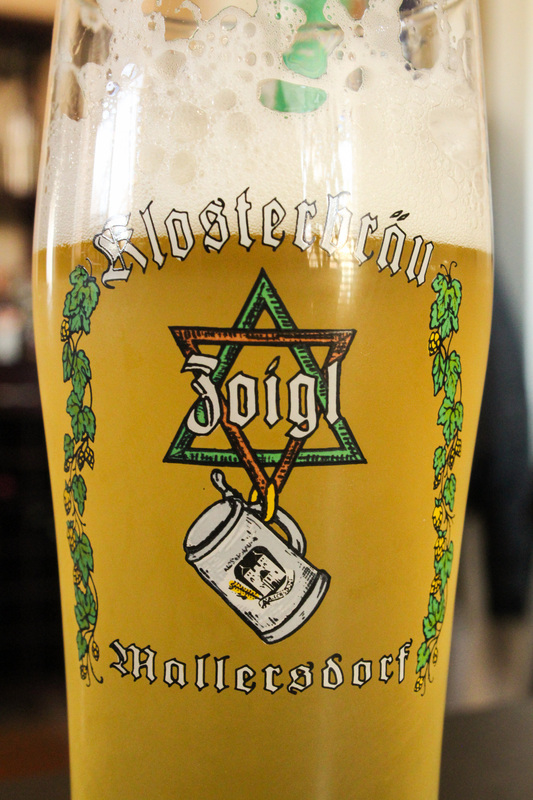 The definition of Zoigl-bier as a style is fluid, and varies with each brewer and batch. It is consistently bottom-fermented and unfiltered, but all other qualities fluctuate. This makes visiting each Zoiglstube a new experience every time it reopens. The batch we drank had sweet notes of bread and honey with hints of fruit and a soft mouthfeel, much like the kellerbier sampled from breweries throughout the week. Two half liters and a plate of currywurst later, we were back on the coach and headed to our hotel, which just so happened to be next to another Zoiglstube. On the short ride to the neighboring town of Windischeschenbach, I learned others from our group had a different, more rowdy experience in which three half liters were consumed under strict table rules that dictated when you could drink. Hah! Once we reached our destination for the night, our Zoigling continued by foot to taste and experience the local culture. We learned much, got soaked in the rain, sang along poorly to a Zoigl pub song, and even made a few friends. This trip has taught me many things, but the most prominent is that beer is meant to be enjoyed with others – at a quiet abbey, on a busy city bridge, on a sunny boat, or drenched at a Zoiglestube. It’s an experience beyond flavor or aroma, evidenced by the bonds forged between half liters of lagerbier. It’s less about the beer, and more about the people you drink it with. And by the time you reach the bottom of the stein, regardless of where you’re from, we’re all neighbors. That all sounds wonderful. A tradition that America should take up soon.